For this week’s Dark Days dinner, the selected meal was a pantry-raided, complex-carbohydrate-rich affair. We were itchy for something toothsome the night before, so the next day I baked some beans and bread. 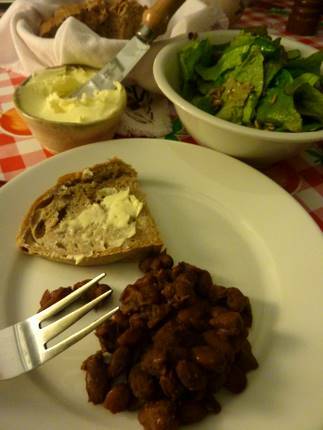 Baked beans, bread and salad: simple, hearty fare that was so welcome on this, the first harsh night of our winter season. Beans: One cup of our cranberry beans, one Copra onion, two cloves of Big Stinky (an unknown but huge hardneck garlic), with dried sage and other garden herbs; two chunks of smoked pork belly (Hopeful Farms pork from Ligonier, IN; smoked at Miller’s Smoke House of Middlebury, IN: both these are Amish-run, so, no websites), and honey from Honey Hound Bee Farms, Eau Clare, MI. Simple and tasty are key on the cold days. I’m always jealous of your vast variety of beans 🙂 And Big Stinky garlic I’ve never heard of… how did you come by it? Mavis, yeah, and kinda boring too but what can I say? I love beans. el do you heat the greenhouse at all?…. Shelly, no, no heat at all. Things DO get quite cold though in there, but mostly they all “take it.” The magic truly happens when there’s a bit of sunshine: by about 2 p.m. it will be toasty in there! 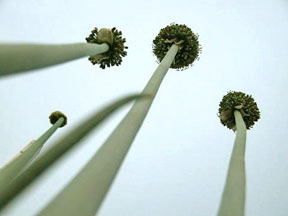 Right now, though, with all this snow and gray skies, no, they’re not the most inviting of places…but it still beats being outdoors, if you’re a lettuce!